Up on the hill, under a pale winter moon, it’s … not a bird, not a plane, nor is it Superman or Thor … although it sure looks a lot like Spider-Man. No, it’s J.C. (Jeff) Anderson, dignified and respected member of the Minnesota Bar, looking sporty and sleek in a gauzy red Spider-Man outfit, gloved hands clutching two pointy-ended rods, body tensed in anticipation of the starter’s signal to launch the downhill slide that will perhaps earn him a share of the spoils on any given Sunday night in January or February. Even as winter fades into the spring-forward sunset, J.C. Anderson is likely of two minds about the slushy decline of the snow season. At the least, the changing of the seasons means he’ll have to adjust to spending his Sunday evenings somewhere other than on the white-capped slopes of Buck Hill. “It gets a little cold out there, on top of the hill,” says Anderson, speaking of his time spent this past winter in pursuit of Minnesota gold — although it might be a good analogy for his work as a top-flight lawyer with the Minneapolis office of Gray Plant Mooty too. Anderson straps on the skis for the Grateful Shred, one of several teams that compete for Sunday night glory in the Ski Challenge league at the storied Burnsville ski center. The league’s regular season runs two months, January and February, with a possibility of post-season skiing on into March at the state championship tourney in northern Minnesota. The Ski Challenge got its start in 1985, offering Twin Cities metro area adults a friendly but still competitive way to hit the slopes, make friends — and relax over a congenial beer or two. The Ski Challenge sponsors adult recreational skiing leagues at various Twin Cities venues, including Buck HIll. The Grateful Shred, not to be confused with the competitor Shred on Arrival team, numbers seven or so dedicated skiers, men and women alike, including the ex-CFO of a publicly held company, a few errant ski patrollers, and Anderson’s grown, ski-happy daughter, Hannah. Hannah, a former all-state high school skier, now coaches youth in the renowned Team Gilboa amateur skiing program at the Hyland Hills Ski Area in Bloomington. “It is something of a family affair for us,” says Anderson, who began his own serious ski career in his adolescent days as a member of the Edina West varsity boy’s ski team. “I’ve stayed involved in skiing ever since,” he says. Anderson seems somewhat self-conscious about his skiing prowess, perhaps because the rolling years have clipped his game to a certain degree. 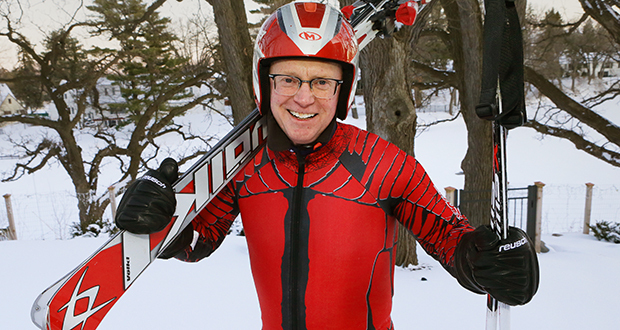 Advancing age does not sway a determined skier from participating in the league. It only changes the scoring system. The league uses an age-adjusted handicapping system to help the more AARP-aged skiers maintain their downhill competitiveness with the young and nimble-jointed. “They give you credit for being older,” Anderson explains. Well, it’s saying something, but platinum out-ranks gold in this league, and Anderson allows that he has won a few platinums in his time, only not so recently. The hills might have seemed a little more forgiving, on younger legs, the turns a bit more manageable. Then again, the training regimen — at least as pursued by team Grateful Shred — turns out to be anything but Spartan in nature. “That’s the great thing about it. There is no training,” Anderson adjures. Or rather, all the training takes place on what he calls “dry land.” “We meet for training in a bar. So everyone wants to keep up with the training,” he says. It’s still racing though. Downhill slalom racing, in this case. Buck Hill serves up a challenging course (the alert reader might recall that it was on the slopes of Buck Hill that Olympian Lindsey Vonn took her first baby strides in skis) but not so much so as to require an EMT team to standby. “Our course is pretty tight,” says Anderson. Like most league participants, he owns a pair of special Grand Slalom race skis, engineered for the snow by the German sports equipment maker Volkl. They’re sometimes affectionately called “cheaters,” says Anderson, because they’re designed to make maneuvering those muscle-straining turns a little less wearing than the ordinary sticks that a slash-and-burn skier like Vonn would use in international competition. The best and boldest of the league’s skiers complete their platinum-worthy downhill runs in 15-17 seconds, Anderson says. His gold standard runs take about 22 seconds or so, he says. “It makes for good exercise,” he says — and it is, after all, good for a lawyer to stay physically active and healthy. All good things must end, at least temporarily, and so it was that this 2018 ski season ended for Anderson a few weeks back. The Grateful Shred, perhaps in a rebuilding season, appeared destined for a mid-tier finish, battling for position with the Tasmanian Snow Devils. It’s back to the training table, then, for Anderson and team, with plenty of time to prepare for next season. He will also swap out his winter skis for ones more appropriate to the snow-deficit season ahead. “In the summer, I water-ski,” he says. As for the Spider-Man ski suit, he may don it even before the snow flies again. “It makes a grand Halloween costume,” he says.